I just found a really cool lens from my dads old film camera, and it just so happens to be an EF mount so it fits on my camera. I dont know the details but im going to try it out tomorrow, has anyone had experience with these kind of lenses? Cool or just unfunctional? Depends on the lens! At the production house I worked at we used a lot of contax zeiss lenses and those are awesome - there's a guide on reduser that gives you more info on them/how to pick them and all that. I'm pretty sure those were used on this shoot. Yes dude! I pretty much use only SLR lenses. It definitely has a style, but the glass is usually wicked (I've taken some big falls / dropped my set up more than enough times). I've been working it for about 6 years this way so you get into the groove of manually focusing, takes a little practice. Yeah, but for video, manual focus is preferred. especially on DSLR's where the auto focus is SKETCHY at best in the field - particularly with slower glass. If you shoot on a canon, many old manual lenses work. Olympus, Nikon, Pentax, M42 screwmount, Yashica, and even R-mount Leica lenses will work. A 5-10$ adapter is all you need. Pretty cool. I use exclusively manual Nikon prime lenses. Straightforward to use, good optics, durable, sharp and give a slew of subtle unique effects. My advice is to try any lens you find that you can somehow get on to your camera and just see what it does. Anybody found any wide lenses That'll fit either natively on a Nikon or can be adapter to a Nikon? lelandbroadhurst Loving This thread tbh. 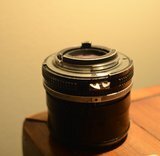 my Nikkor 85mm (first pic) has the factory aperture ring which is compatible with modern DSLRs (ex. D7000) aperture tab. The second picture of my 135mm shows the notch I filed in to the uniform-depth "scallop shell" aperture ring so it would fit on my camera. Another thing to keep in mind are that these older Nikon lenses are full-frame lenses, (designed for 35mm SLR cameras), so on a crop-sensor DSLR, their focal length is magnified by roughly 1.5x (50mm= 75mm) and the maximum aperture will be about a stop larger. This is extra fun if you are lucky enough to have both a full frame and a crop sensor DSLR, as you essentially have two sets of lenses in one. I use a nikon 70-210 f4 e-series lens for all of my long lens tripod work. Its a push pull lens, sort of annoying but yet convenient for subtle zooms. It was $50. I scratched the front of the lens pretty good, so I'm probably going to pick up another one soon, its a great lens. Only thing old lenses don't fulfill is the nice wide lens. They made them, they're insanely expensive and not better than any modern wide lens.